Selling online courses have completely changed the lives of so many entrepreneurs like you and me. I personally know and have consulted many creators who sell online courses and regularly make a five-figure or even a six-figure income every month. More importantly, such success stories aren't just limited to a few make money online niches. Rather there are thousands of successful course creators who earn a full-time income by teaching online courses in a variety of niches. Take my friend and client David Young for example. He is a drone enthusiast and the founder of Drone Launch Academy. His course FAA Part 107 Remote Pilot Exam Prep Course has earned him over $400k over the past 2 years. He quit his corporate job in early 2018 and now works full-time on his online course business. Selling online courses is a great opportunity for you as well if you want to share your knowledge with others and make money in the process. 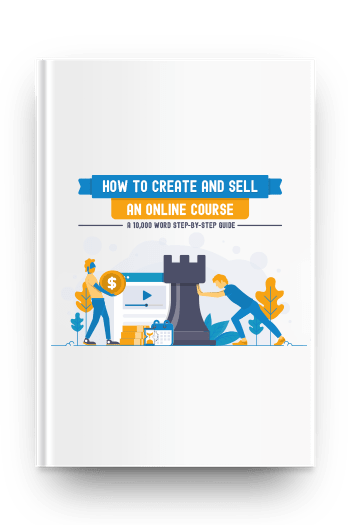 In this guide, I'll show you everything you need to know and do in order to successfully create and sell online courses from your own website, even if you don't have an audience. You can click on a link above and go directly to that chapter. However, I will recommend that you read this guide from start-to-finish and also download the PDF version of this guide for future reference. Why Create and Sell Online Courses? The eLearning industry is expected to reach $325 billion by 2025 as per the Global eLearning Market Analysis & Trends report. eLearning industry has major growth potential and we're going to see more and more students turn to online courses to further their education. Everyone can teach online no matter what their niche is. You can make money online teaching yoga, photography, web design, cooking or for that matter anything that's worth sharing and in the process, you will help make the world a better place. The amount of money that course creators make on an average is significantly higher than those who make money by selling ads on their blogs, via videos on their Youtube channels or even by selling e-books. Online courses are digital products which you create once but can sell for years. More importantly, your income isn't determined based on the number of hours you work. So, online courses are ideal from a scalability point of view and as well as from a passive income point of view. The barrier to teaching online has come down significantly. The technology has made it really easy for you to host & sell online courses from your own website even with a small budget. The only thing that I want you to do before we go through the first chapter is to feel confident that you too can teach online and make a business out of it. Get a PDF copy of this epic, 10,000-word guide so that you can refer to it in the future easily. Enter your email below to download it instantly. Yes, Send Me My PDF! The first step in selling online courses from your own website is to figure out what you will teach your students. something that potential students are willing to pay for. So, let me show how you can come up with ideas for your online course and then validate them. 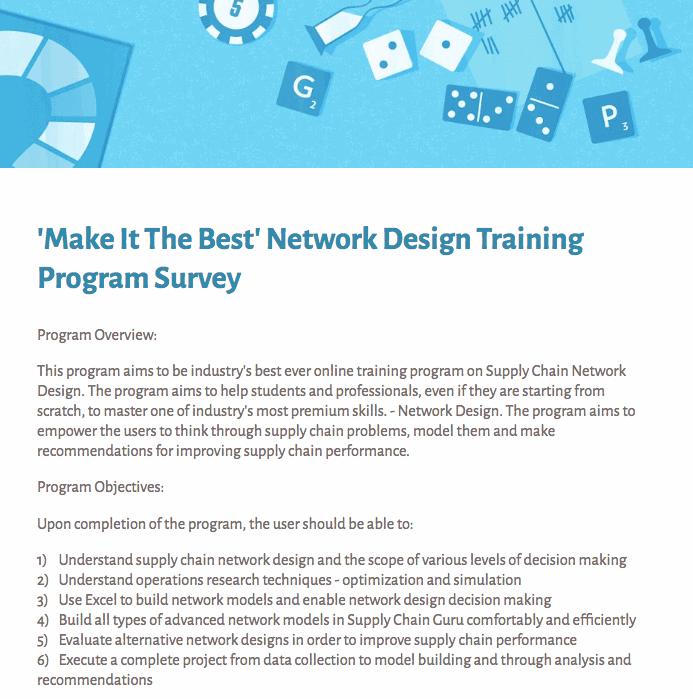 When I was planning to create my first course, I had close to 4 years of experience in the supply chain industry and I knew it was something I was good at. So, coming up with topics for my online course was really straightforward for me. What if you don't have such a skill or professional experience? It doesn't matter! Bcoz you might have a passion or a hobby that other people are interested in learning about. Or, you might have overcome a personal challenge that many people struggle with. Under each of these brackets, list down the potential topics that you can teach others about. You can use this ideation worksheet to list all your ideas. You should come up with a minimum of 5-10 ideas for your online course. At this point, just think about the topics that you can teach and don't worry about things like market demand, competition etc. Specific courses are easier to sell than broader courses and so, I recommend that you start with a specific idea that promises specific results to a specific audience and as you move along in your journey as a course creator, you can consider creating broader courses. Most new course creators completely skip this part. They will come up with some ideas for their online course but then they pick one randomly without validating whether their potential students would want to learn a course on that topic or not. This ultimately turns out to be a big mistake and they end up spending a lot of time and money creating a course which just doesn't sell. So, you need to validate your course idea and make sure that there is a demand for it before you start work on content creation or marketing. The easiest way to validate interest in your course topic is by checking the search volumes for related keywords on Google. The tool that I recommend you use for this purpose is Ubersuggest. It is free to use and doesn’t require you to create an account. => Go to Ubersuggest website and do a search with your keyword. Now analyze the results. You should then check the search volume for your main keyword as well as the related keywords. A high search volume for your keywords would mean that people are interested in your niche. 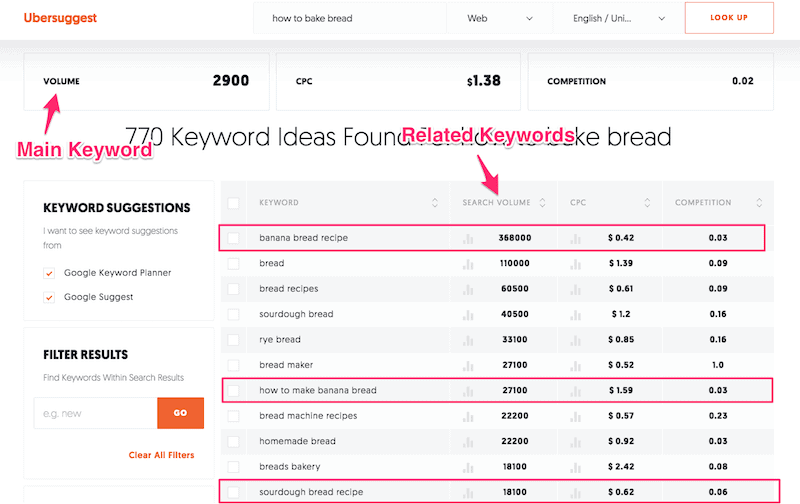 This keyword research also gives you insight into what related topics people are interested in and so, you can use this information to fine-tune your ideas. Youtube is the largest video platform as well as the second largest search engine in the world. On Youtube, you can find videos on almost any topic and in any possible niche. Plus, Youtube has a huge audience for tutorial-type and how-to videos that give you a strong indication of interest in your course topic. => Go to www.youtube.com and search for your course topic. Analyze the search results and the video views. You can also read comments on these videos as that will give you a sense of your students' pain points and what they want to learn. Udemy is the largest online course marketplace and it has millions of students who take courses in virtually any niche. While I don’t recommend you use Udemy as the main platform for teaching online, it can provide you a lot of information that will help you validate the demand for your course. => Go to www.udemy.com and do a search for your course topic and related keywords. Now check the courses that come up in search results. => Select a particular course and check the number of students enrolled in the course. ​=> Go back to the search results and repeat the previous step by selecting a different course. If you find a few courses related to your topic and a few thousand students enrolled in these courses, that’s great news because this shows that there is a significant number of students who are willing to pay for your course topic. This is one of my favorite ways to validate an idea because with this method, you don't just look at numbers but you actually listen to your potential customers. So, you first need to identify Facebook groups, niche forums or any other online communities (e.g. Quora) where your potential students hang out. Once you're part of the community, search for your course topics and follow the conversations. See what people are asking about and if you want, you can always start a new conversation around your course topic to see what sort of interest it generates. One of the most effective ways of testing your product idea is by collecting direct feedback from students and a survey is a great tool for doing that. 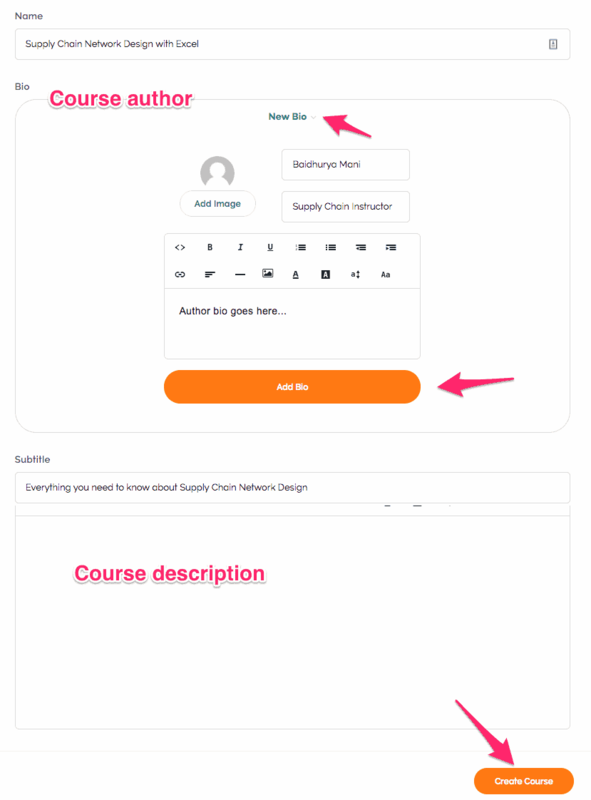 When I was planning to create my signature course Network Guru, I sent out a brief survey to my students asking them what they think about the course idea and whether they would be interested in enrolling in the course when it launches. If you have an audience of your own, this method is really straightforward to execute. You can create a short survey in Google Forms or any other forms solution and send this survey to your audience. If you don't have an audience of your own, you can still send the survey to your friends and colleagues as well as share the survey in various online communities and groups. If you need an even stronger validation for your topic, you can sell your online course even before you create it. To pre-sell your course, you can set up a blank course on Teachable and create a sales page that explains what the course will be about. If you can successfully pre-sell your course, there is no better way to validate your course idea and you can be 100% confident about investing time and money into turning this idea into reality. However, pre-selling only works if you already have an engaged audience whom you can pitch your idea to. Selling your course idea to a cold audience will not work in most cases. If you followed all the steps in this chapter, you should have an idea for your online course by now. Leave a comment at the bottom and let us know what your idea is. ​Now, it's time for you to start working on creating your course content. One mistake that most new course creators make is to think about the value of their course in terms of the amount of content or the hours of videos it has. They will then try to add as much content to their course as possible which makes the entire process not just time-consuming and expensive but also results in information overload for the students. Remember you’re creating a specific course that promises specific results to a specific audience. So, your course doesn’t have to include everything you know on the topic. It just has to cover things that are required to help your students achieve the promised results. Before you start creating the content, you will need to create an outline for your course. Course outline (or curriculum) is like a plan for your course and it will help you keep organized and focused throughout the content creation process. When creating your course outline, start with the end results for your course and then think about the different stages a student will go through in order to achieve those results. 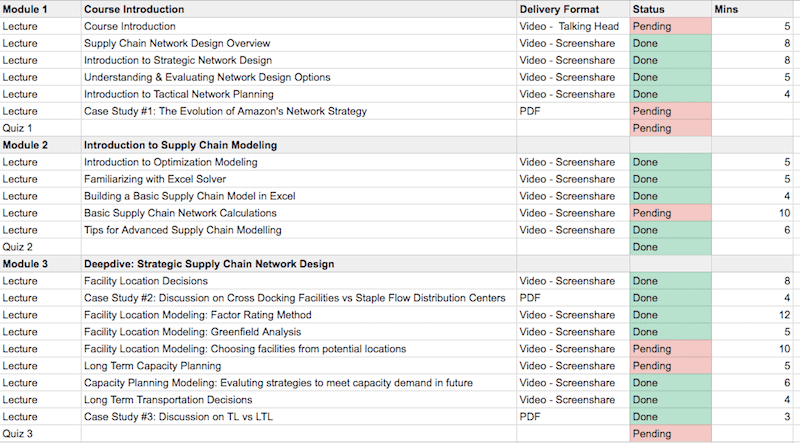 These stages are basically the modules (or sections) and you should have no more than 7-8 of them in your course. Each module has a learning objective as well and you’ll need to break the modules down into individual lessons. Think of the individual lessons as the steps that your students will need to take in order to achieve the learning objectives for a particular module. Keep your lessons short, preferably between 2-10 minutes as shorter lessons tend to result in higher student engagement. If you want to use this course outline template to plan the content for your course, you can access it here. Once you have created the outline for your course, you need to decide the delivery format for your lessons. Video is easily the most popular and engaging delivery format for online courses and so, you must include video content in your course. In addition, you should use a mix of other formats including audio, text, PDF, interactive quizzes etc. to deliver your content. The delivery formats for your course will depend on a few things including the nature of the course, it’s learning objectives, course pricing etc. and based on the formats you choose, you can then start creating the actual content for your course which I'll discuss next. Screencast videos are really effective if you want to create tutorial type content or record slides with voice narration. Plus, they’re much easier to create than talking head videos. In fact, all the videos in my first course except the course overview were basically screen recordings and it worked well for my course topic. In order to create Screencast videos, you should use Camtasia which is the best screen recording and video editing software in the market. If you’re on Mac, you can also try Quicktime Player for recording screen for free. Now, let’s briefly discuss talking head videos. Recording good quality talking head videos is more complex than recording your screen. First, you’ll need a camera to record your face for which you can either use your phone or an external webcam like Logitech C920. At this point, you don’t really need to invest in a professional camera or video recording equipment. Another important aspect of your videos is audio quality and in order to get good audio quality, you’ll need an external mic. The one that I personally use and recommend is Blue Yeti. When you’re creating videos for the first time, don’t worry much about the video quality because your videos might not look that professional and that’s fine. Instead, focus on delivering value through your videos and you’ll do well! Your videos will automatically become more polished and professional as you create additional courses in the future. Before we close this chapter, let’s talk about creating PDF content for your course. Creators use PDF format generally for creating worksheets, case studies, and other support documents. If you want to create and design the PDF documents yourself, you can either use Microsoft Word or you can use a design tool like Canva. You also have the option to outsource and you can get a PDF designed for as little as $5 using a service like Fiverr. You can also use Fiverr for video editing and to get your videos transcribed for cheap. Content creation for your course will take some time and so, you should work simultaneously on other things like building your course website and growing your audience. Not building an email list right from the word go is one of the most common mistakes that course creators make. Most creators start thinking about funnels and email list only after their course goes live. In fact, you should create a basic sales funnel and start building your email list as soon as you pick your niche and finalize your course topic so that by the time your online course is ready, you have an audience to sell your course to. But what is a sales funnel? Most of the people who visit your website for the first time aren't going to buy your course. Rather they aren't ready to make a purchase yet. You will require a sales funnel so that you can capture their email address and then market your course to them via email. Email marketing is the best way to sell your online course and that's the reason building an email list is so important. So, let me show you how to build a minimum viable sales funnel to acquire new leads and grow your email list. The first stage of your funnel requires you to have some content which is freely available and for which a reader doesn't need to opt-in. The free content can be in the form of blog posts, videos, podcasts, social media posts and even images and the main purpose of this type of content is to just provide value and warm your target audience. So, you can create a Youtube Channel to share videos or create a blog to share articles or create images for Instagram or just comment regularly in Facebooks groups. These are just a few ideas that came to my mind. 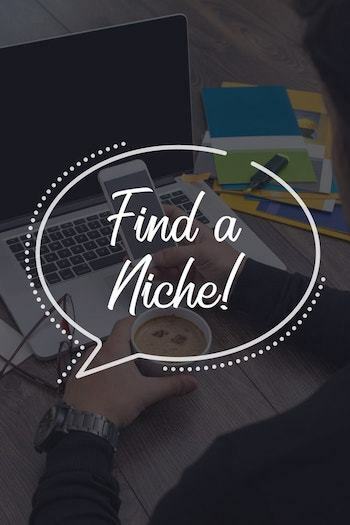 Now you know your niche the best and so, I leave it up to you to come up with ideas for creating content. 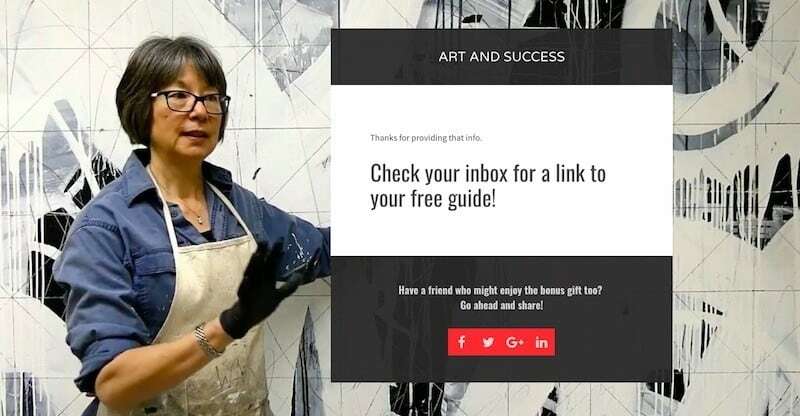 Getting people to sign up to your email list should be easy once you warm them with free content and you need a lead magnet for getting their email address. A lead magnet is a piece of content that's available only when someone signs up for your email list. A well-done lead magnet must solve a specific problem, it must be created for quick consumption and it must be related to your course topic. And keep in mind that a 2-3 page lead magnet is as effective as a 300-page e-book. So, focus on content and quality rather than quantity. Once you finalize a lead magnet idea, you can format your content and create a good-looking lead magnet yourself using a tool like Canva or you can get it done by a freelancer on Fiverr. If you don't already know about it, a landing page is a dedicated page with a singular focus of making your offer convert. The offer can be a lead magnet or even a paid course or an e-book. These are examples of landing pages. 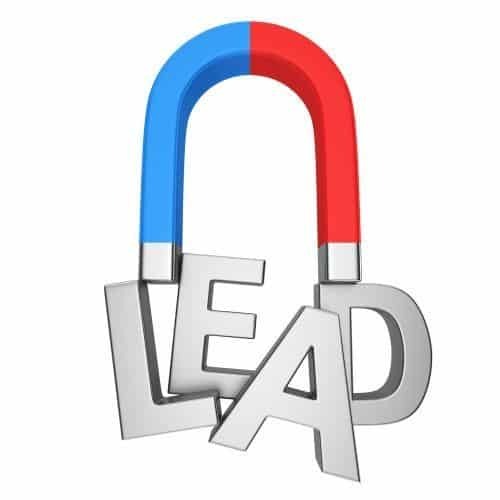 Now landing pages are really effective at converting visitors into subscribers and so, you need to create a landing page for your lead magnet as well. 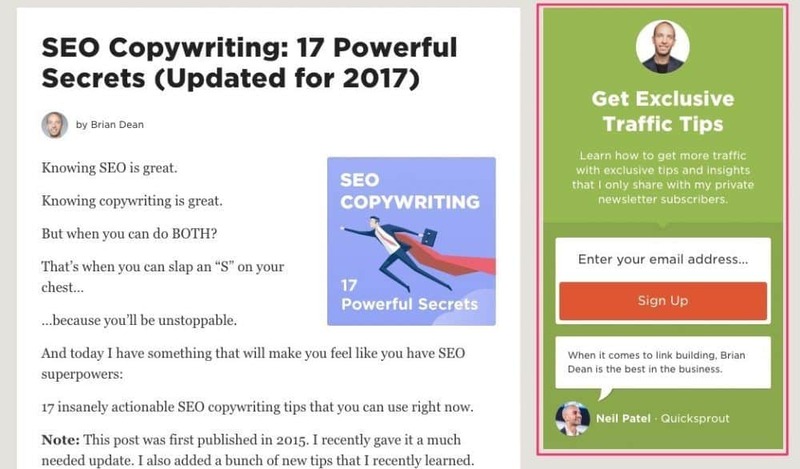 You can promote these landing pages in your blog posts, via social media, FB ads etc. Basically, you'll either leverage the free content that you created in the first step or run paid ads to drive traffic to your landing page(s). 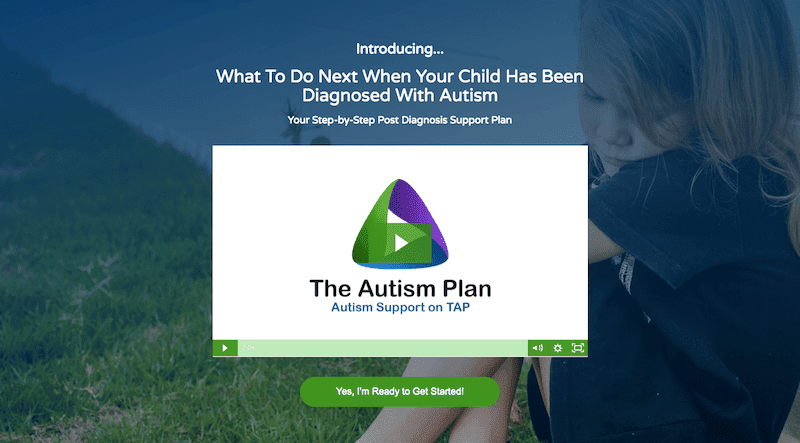 Once someone signs up, they are taken to a thank you page like this where you can guide them on the next steps and even ask them to take further action like buy a low priced e-book or a mini-course. Now, if you were to create a landing page on your own, you'll need to know how to code, have good design skills and spend numerous hours testing various elements before you can create a highly effective landing page. So, I recommend that you use a landing page builder to build your landing pages. A good landing page builder will make it easy for you to create landing pages and more importantly achieve higher conversion rates. The good news is that there are many options out there in the market and the bad news is that finding the right one can get pretty confusing and frustrating. Leadpages is the most popular landing page builder in the market with hundreds of high converting landing page templates and an easy to use drag-and-drop page builder. It is super easy to use and reasonably priced which makes it the most beginner friendly landing page builder. ClickFunnels is more than just a landing page builder as it lets you build end-to-end sales funnels. While it is the most feature-rich funnel builder in the market, it is a little expensive and has a steeper learning curve and so, it is ideal for intermediate and advanced users. Thrive Architect is a WordPress based landing page creator and is pretty inexpensive. However, you'll need a WordPress site to build landing pages using Thrive Architect and I recommend you go this way only if you're WordPress-savvy. If you're a beginner, this is certainly not the right option for you. While landing pages are the most effective way of presenting your offer, you can also use opt-in forms to collect leads, especially on a blog. Another type of opt-in form that we see on Backlinko website is a widget opt-in form. Another opt-in type that is really popular is inline forms (or within content forms). Once you click on this button, a popup will appear which will ask you to enter your email address in order to get the freebie. These are all examples of opt-in forms and they're an effective tool for conversion if you run a blog. They won't work if you use Youtube or FB Ads to drive traffic. Use specialized tools (e.g. Sumo) to create opt-in forms. Also, you can display the same offers on your opt-in forms that you display on your landing pages. It's very unlikely that a new subscriber will purchase your course and turn into a paying customer as soon as he/she subscribes. 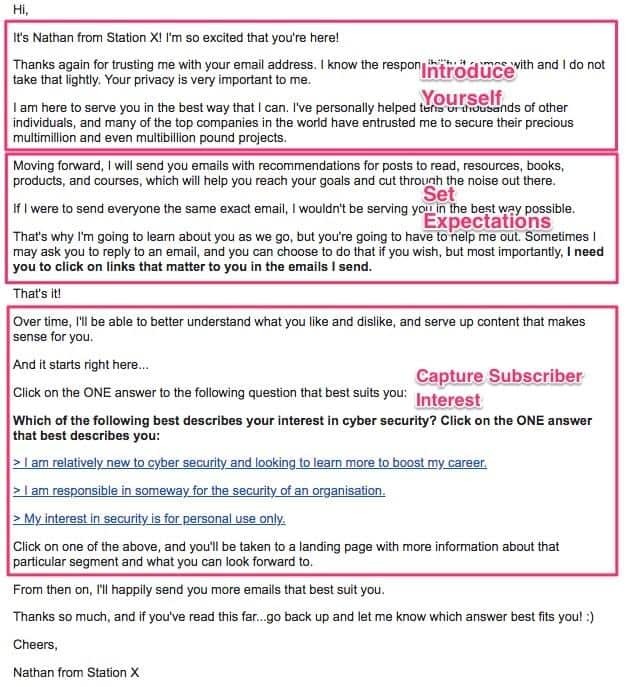 So, you should create and set up a series of automated emails for your new subscribers. The basic idea behind sending a welcome email series is to provide value to your subscribers and make them know, like & trust you. At this point, you shouldn't engage in any sort of selling. There are different approaches that you can take while creating a welcome email campaign. But the first email that you should send in this series has to be a welcome/introduction email that goes out immediately upon subscription. Apart from the welcome email, you should send 4-5 additional emails as part of the welcome campaign over next 7-10 days. One option is to create an email course where you teach your subscribers something of value and something related to your online course. This works pretty well for selling online courses as it helps you build trust, establish your authority as well as generate demand for your online course. Another option is to repurpose your existing blogs posts or even videos for sending the emails. In fact, you can even write short emails and then direct your subscribers to the blog posts/videos. You can also create an email series where you just tell your subscribers about some common mistakes users make in the industry or even just tell them about some common myths. There are just a few ideas for creating your welcome email campaign. There are so many other things that you can do like sending free resources, youtube videos or even articles from other blogs. If you have an evergreen course, you can transition your subscribers into a sales campaign as soon as they complete the welcome sequence (we'll talk more about selling your courses in the last chapter). However, if your course isn't open for enrollment currently or isn't ready yet, you will have nothing to sell to them immediately. In this case, you need to make sure that your subscribers are constantly engaged and so, you need to email them on a regular basis. In order to manage your entire email marketing, you'll need an email service provider. You need an email marketing solution so that you can store the subscriber information, send them emails and most importantly, automate email marketing. There are quite a few options in the market and some of the popular ones include MailChimp, ConvertKit, Drip, and ActiveCampaign. However, the email marketing solution that I recommend is ConvertKit. ConvertKit is a popular email service provider that offers powerful automation capabilities but at the same time is easy to use and affordable, making it ideal for online creators. You can try ConvertKit for 30 days for free. 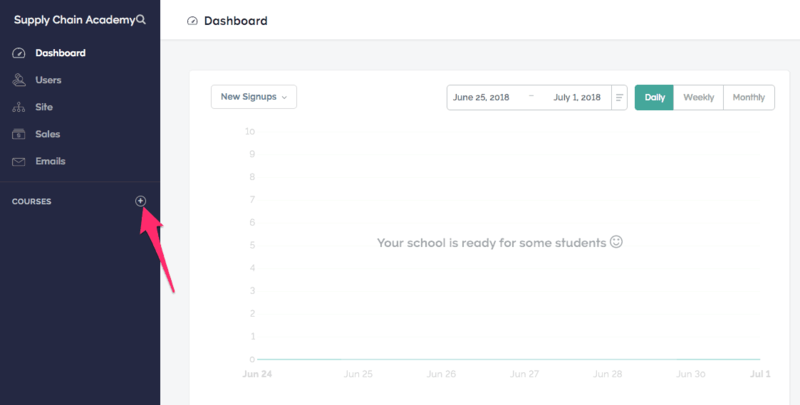 You now have a minimum viable funnel up & running and you can start sending people to it now without worrying about whether your online course is ready or not. In the next step, I will show you how to drive traffic to this funnel and grow your email list. You have made some significant progress, your sales funnel is live and you have also set up a follow-up sequence to nurture your subscribers. So, what you now need to do is to drive traffic to your funnel. Driving traffic is key to building your audience and is also the #1 thing that course creators struggle with. If You Build It, They Will Come - It is really surprising to find so many people actually believing in this theory. They create a course with an expectation that people will find it on their own and then purchase it. 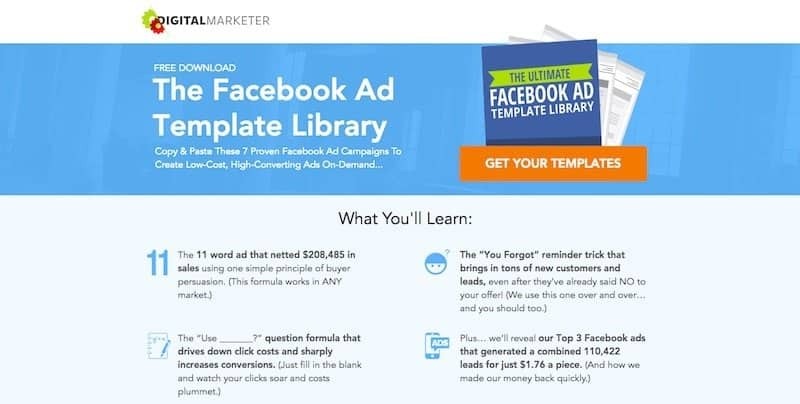 Driving Traffic = Facebook Ads - Another mistake that many course creators make is to think of Facebook Ads as the only/main source of traffic which is far from being true. Get Traffic from Everywhere - Many course creators struggle with traffic because they try to drive traffic from every possible source instead of focusing on a couple of traffic sources. It's important that you avoid these mistakes while creating your traffic strategy. Blogging is an ideal way to attract and engage your potential customers. If you want to build a strong presence on the internet (which I'm sure you do), you should consider starting a blog. The key to success with blogging is to blog on a consistent basis. If you blog on a regular basis and if you put some effort into optimizing your blogs for search engines, you can drive significant traffic and grow your email list. YouTube is the second largest search engine on the planet and there are millions of people who visit YouTube for all sorts of video tutorials. You can get started by creating a YouTube Channel and then publishing relevant videos on your channel. 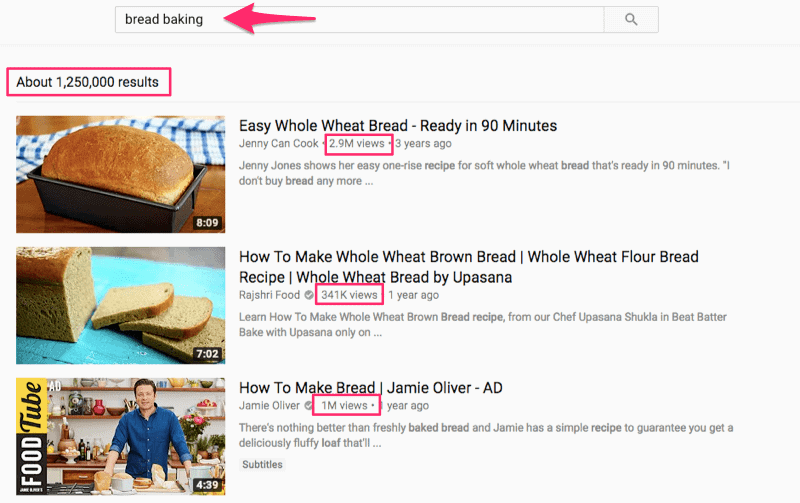 This will not just help you get traffic from YouTube but you can also rank for the search terms in Google. Mark Lassoff from LearnToProgram.tv created a massive student following on his YouTube channel and uses that following to promote his online courses. Udemy has millions of students on its platform and there is a high chance that a number of these students would be interested in your course topic. If you have a course which you intend to sell at say $99, there is no point in selling it on Udemy. You can rather create a shorter version of the course and put it on Udemy. You can either make it free or even sell it. This will help you build an audience on Udemy. 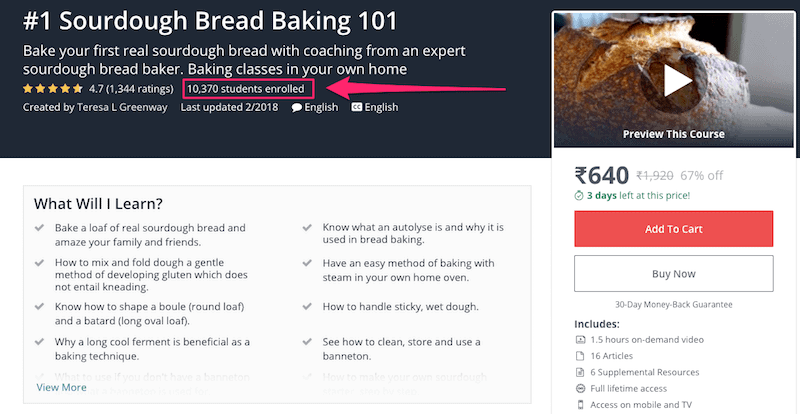 Even though you can't directly market your external courses to your Udemy students, you can always send these students to your blog and engage them on your website and grow your email list. There are few strategies which are as effective as guest posting in helping beginners grow their audience. If you plan it carefully, guest posting will give you guaranteed results. You should come up with 5-6 content ideas which you haven't published on your own website. You can then reach out to smaller blogs that write on a similar topic and pitch them your ideas. Targeting larger publication like Forbes, in the beginning will be counter-productive as your chances of getting accepted will be low. Facebook is the largest social media platform and you can use it to promote content in any niche. You can share your blog posts, videos and other interesting content from the internet with Facebook users. To get started, you will need to create a Facebook Page from where you can share your content, do Facebook Live Events and even host giveaways to build an audience for your online course. Another effective strategy to build a highly engaged audience on Facebook is to create an FB group. Pinterest is another popular social media channel which you can use to share your images and infographics. You can then drive traffic to your website by including a link to your website or landing page in the post. 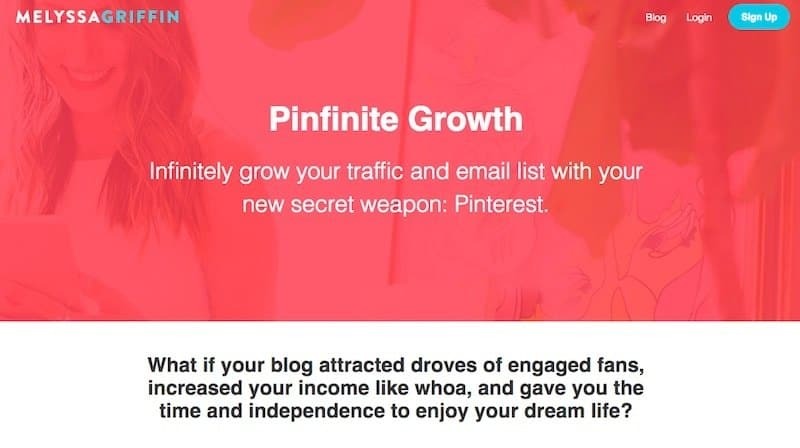 If you have a blog and if you can create images on a regular basis in your niche, Pinterest is a social channel that you should consider for promoting your lead magnets. LinkedIn is another popular social networking site where you can promote your content. The best way to promote your content on LinkedIn is by publishing on LinkedIn Pulse. You can either create original content or use some of your existing content and publish it on Pulse. When I was growing my brand Supply Chain Modeler, my first 500 subscribers came primarily from LinkedIn Pulse. You can include a call to action to join your list or even promote your course directly. Amazon is the #1 search engine for buying products online. It's very likely that you have an audience for your course(s) on Amazon and to tap into that audience base, you can repurpose your course content into an e-book and self-publish it on Amazon. If your course is ready, you can hire someone on Upwork to create an e-book based on your course content. Within the e-book, you can include links to your free as well as paid offers. You can use it to build your list and sell your courses. SlideShare is a great place to share your presentations. You can actually use one of your course ppt and publish it on SlideShare. You can include calls to actions within your slides and this way, you can drive some additional traffic to your website. Search for a few Facebook groups related to your course topic and join a few of them. The key to success with this strategy is to not promote yourself directly but to add value and help others in the group. This is one strategy that I have used extensively to grow my freelancing business. I am pretty active in a couple of FB groups and answer any questions that users have and help them without directly promoting myself. The focus should be more on building relationship and authority and you can get some great results from this approach. Quora is a Q&A forum where users ask all sorts of questions. 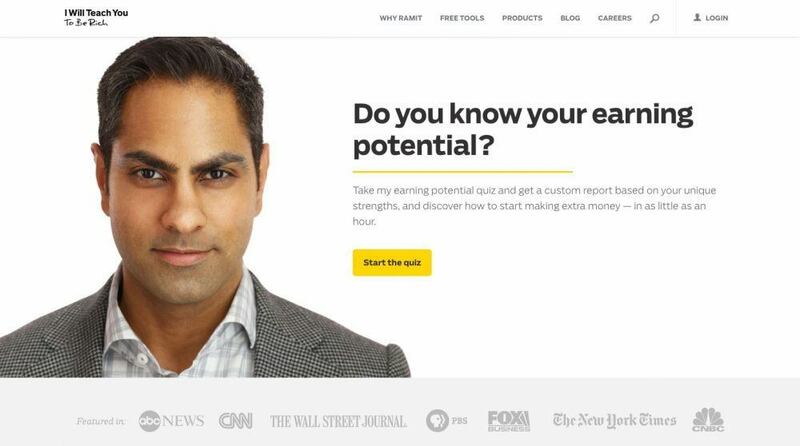 You can easily find questions which are relevant to your niche and then answer those questions. The key here is to be less promotional and focus on adding value to the discussion. 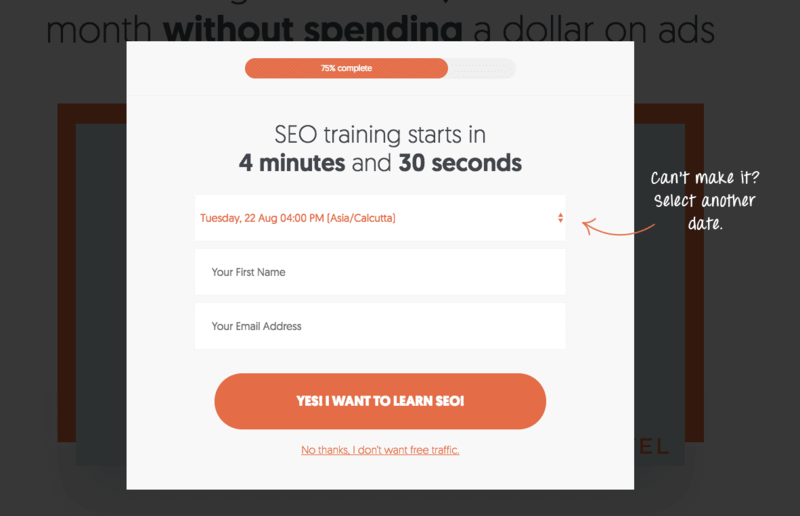 And you can obviously include links to your landing page and your course(s) in your answer. This strategy is very similar to commenting in Facebook groups. You first need to find online forums which are related to your niche. Once you find such forums, join them and start helping other users. You can answer their questions, provide them with helpful content from your blog and your YouTube channel. This will help you build a relationship with the forum users, and once you build authority and trust, you can see massive interest in your courses from these users. It's not as easy to drive traffic to your website organically as it used to be 5-6 years back. Plus, many of the organic traffic strategies take time to yield results. As a result, you should consider using paid ads to drive targeted traffic to your blog posts and your landing pages. Depending on your niche, you might want to try Facebook Ads, Google Adwords or LinkedIn ads for your online course. Using FB Ads, you can target users based on their demographics, interest, and action and if done well, you will see some quick results. Affiliate marketing is really powerful and it can help you get results much quicker. The biggest advantage of affiliate marketing is that you don't need to spend money upfront. Rather, you share a certain % of revenue once a sale is made. One of the best ways to quickly grow your email list is to run a giveaway. In order to run a giveaway, you need to find some products, either physical or digital that your audience will find enticing. Once you select a prize, you'll need to set up your giveaway. To set up your viral giveaway, you should use a tool like Interact that lets you give extra entries to users for sharing your giveaway on social media and email. However, keep in mind that the subscribers that you get from giveaways will be less engaged than your other subscribers and you should weigh in on this before deciding to run a contest. I am a big fan of Search Engine Optimization and I recommend that should start focusing on SEO if you create content like blogs or videos on a regular basis. SEO is one of the main sources of traffic for this blog as well as a couple of my other blogs. You should keep in mind that there is no shortcut to getting search engine traffic, and it will be months before you start seeing some results from your SEO efforts but believe me, it will be worth it. On-page SEO is about structuring your content in a search friendly manner and it includes things like using your focus keywords, optimizing title tags etc. Off-page SEO is more about link building i.e. getting backlinks from other relevant websites. Search engines treat backlinks as an indicator of a site's authority. PRO TIP: You shouldn't try to use every possible marketing strategy in order to drive traffic to your sales funnel. Rather, you should focus on a couple of strategies that you think will be the most effective in helping you grow your audience. These are just some of the most popular strategies to market your online course. There are so many other channels through which you can promote and market them. You should also realize that you don't necessarily need to run paid ads in order to grow your audience. If you're ready to put in the hard work, you can grow your audience by using the simplest strategy of commenting in relevant Facebook groups. Before you can start selling it, you need to get your course online! In order to do that, you need an online course platform that will let you host your course content, create members area and deliver your course. The good news is that you as a course creator have quite a few options for hosting & selling online courses. More importantly, the technology has made it really easy for you to build your course website and you don't need to have coding skills or be tech-savvy in order to do that. I have helped hundreds of creators build their course websites on all the popular online course platforms including WordPress. Of all the platforms I have worked with, I found Teachable to be the easiest to use and most beginner friendly while offering enough flexibility to meet your needs as your business grows. 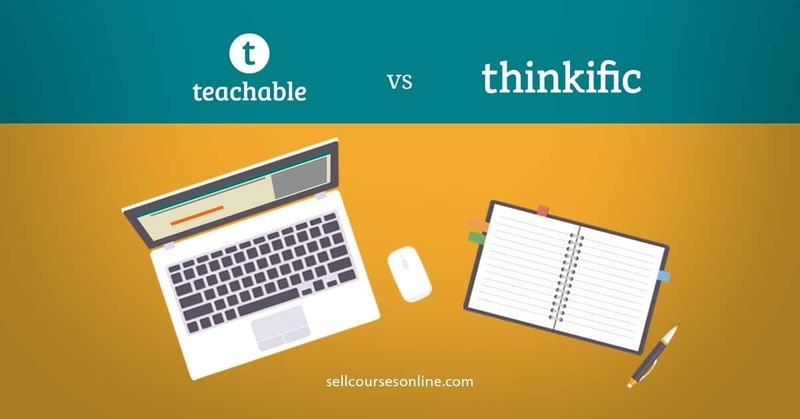 As a result, I recommend that you use Teachable for hosting & selling online courses. 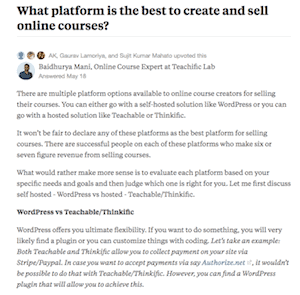 Teachable is an easy-to-use, integrated solution that allows content creators to create & sell online courses through the platform even if they have no tech skills. With Teachable, you can build your course site, host & protect your content (videos, pdfs, quizzes etc. ), hide it behind a paywall, deliver the content to the students and further engage with them, and you can do all this even if you have no coding skills. Most importantly, Teachable offers complete ownership of your course, content, student data, branding and pricing. More than 20,000 course creators, including big names like Pat Flynn and Melyssa Griffin, use Teachable to host and sell their online courses. Why do I recommend using Teachable? Short answer: Because at this point there are no better/easier ways to build a course website. Teachable is easy to use & set up. You can create a good looking, fully-fledged course website on Teachable even if you don't have any coding skills or a technical background or without hiring a developer. Teachable has been designed to scale and so you don't need to worry about anything related to technology as your website grows in size and scale. It doesn't really matter whether you have 100 or 10,000 students on your site, or whether you have 10 or even 1000 courses. Teachable takes care of all the techy stuff for you including things like hosting, site performance, security, backups, updates, and maintenance. Their team takes care of all these stuff which saves a lot of time and lets you focus on more important things like creating courses and selling them. Teachable's pricing is flexible and they have a FREE plan as well. As a beginner, one of the biggest advantages that you have with Teachable is that you can start with their free plan and switch to one of the paid plans later as you grow. Teachable offers 24/7 customer support which you can rely upon. So, if you face an issue or have some other questions, you can reach out to the support team and you can get help pretty quickly. In order to create a course on Teachable, you first need to signup and create an account. Once you're signed up, go to your admin dashboard and click on the + icon next to Courses in the sidebar panel. You can modify these details later and so, click on the Create Course button at the bottom. Once you create the course, you will be taken to the curriculum page of your course. The curriculum page is where you add content to your course. 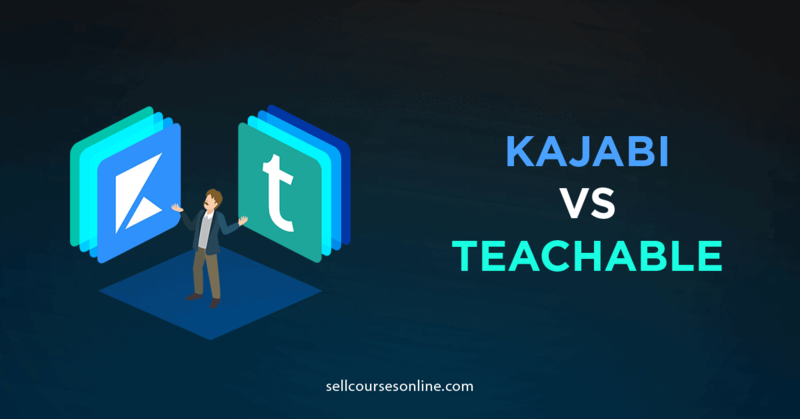 Curriculum in Teachable consists of two different units - sections and lectures. A lecture is the smallest unit and this is where you add actual content (videos, text, audio etc.) while a section is nothing but a way of grouping your lectures and doesn't hold any actual content. You can think of a section as a module in your course while a lecture is an individual lesson in a particular section/module. To create a section, click on the New Section button at the top. You'll be taken to a new window where you need to enter a name for the section and click on the Create Section button. Now that you know how to add a section to your course, let me show you how to create lectures and add content to them. You can either click on the New Lecture button to create lessons one by one or, you can click on the Bulk Upload button and upload all your content at once. Once you click on the Bulk Upload button, a popup appears where you can select the content that you want to upload to Teachable. 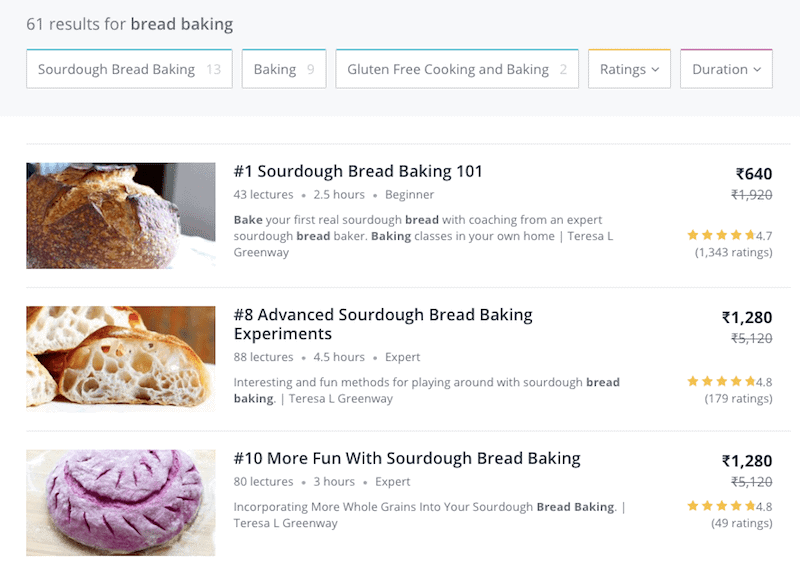 Teachable will automatically create a separate lecture for each content piece. 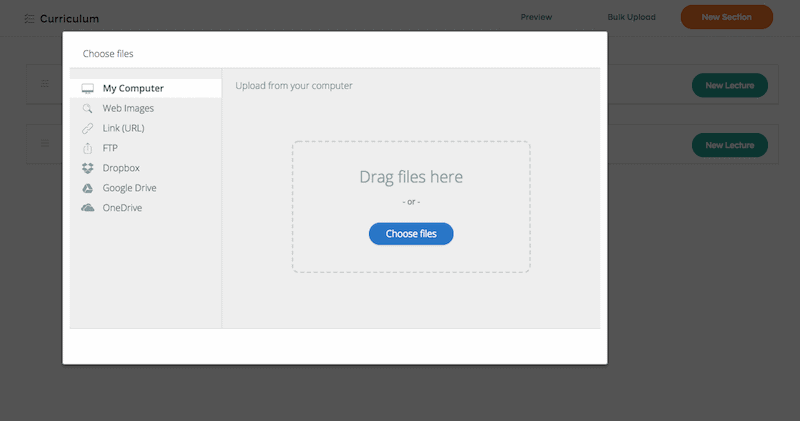 Once you're done uploading your content, you can publish your lectures and make sure to check preview and download settings for your lectures. That's it! Here I just wanted to show you how easy it is to create an online course with Teachable and if you want to learn the exact steps how to do that, you can sign up for their free weekly live training. Before you can launch your course and sell it to your audience, you need to price the course and create a sales page for it. Let me show you how to do that. While these approaches make it easy for you to decide a price for your course, the pricing is not optimal. Let’s take an example. If you price your course very low (say $20), you might get a large audience for your course but it won’t help maximize your course revenue. Similarly, if you price your course lower just to undercut your competitor, you basically start a race to the bottom. You’ll be better off differentiating your offer rather than undercutting. So, how should you price your online course? I like to think about pricing in terms of the value and the benefits that a student gets out of a course. So, if a course solves a huge problem for a student, you can charge hundreds of dollars or even thousands of dollars for it. If a lawyer were to learn website design using free content, he would spend say an additional 20 hours to learn this stuff. Or if he were to hire someone else to design a website for him, it would cost him say $2,500 - $3,000. When you think from this angle, you’ll realize that your course is much more valuable and so, you should go for a premium pricing. If you feel that charging a premium price will make it unaffordable for some of your students, you can consider offering a payment plan where a student can pay for your course in multiple installments. ​If you’re still not convinced about charging a premium price, you can start with a baseline price. Teachable recommends that you price your course at least $100 (baseline price). Finally, you know your course and your audience the best! So, take those into consideration and set a price point for your course which you can justify to your students. Whether you go for baseline pricing or premium pricing, it's up to you and you can always test different price points as you move along. To present your course offer, you need to create a sales page. A sales page is a type of landing page that describes your course to your audience and convinces them to sign up for it. 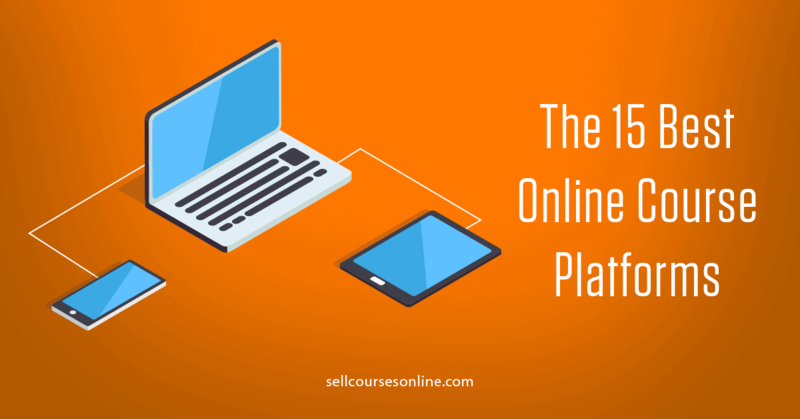 It is at this stage that your potential customers decide whether to enroll in your course or not and so, your sales page can actually make or break the success of your online course. Apart from the copy, it's important to have a good design for your sales page as well. Make it a point to use a lot of high quality & relevant images on your sales page. As far as the tech for building your sales page is concerned, you can create your sales page either using Teachable or by using your landing page builder like ClickFunnels and Leadpages. A sales page can go a long way in boosting your sales conversion and so, you should put effort into creating a good sales page for your online course. Your online course setup is done and now you can move on to the last step where I'll show you how to launch your course and sell it to your audience. 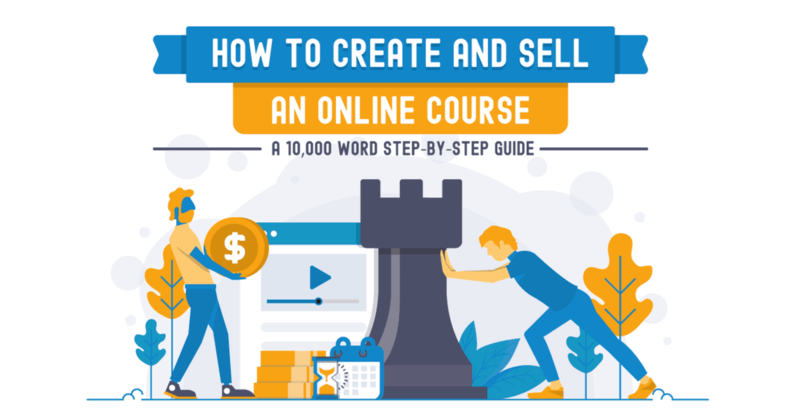 You have put in some really hard work to create your course and build an audience and now it's time to sell your online course to them. This is in a sense the most important step in the entire process because everything you have done till now will be of no use unless you get this part right and your subscribers buy your course. You can either sell your online course using a closed cart approach where the course opens for a few days (launch period) for enrollment and then closes or you can sell it as an evergreen course which is always open for enrollment. If you follow the first approach, you can open your cart every 1-6 months depending on the size of your audience and the number of courses you sell. The course will be open for enrollment for a few days and once the launch period is over, the cart will close. 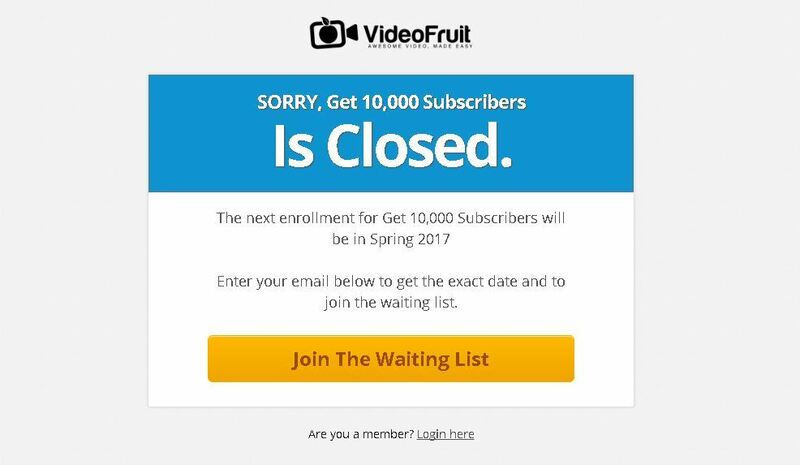 Bryan Harris from VideoFruit.com uses this technique for his Get 10,000 Subscribers program. When you try to enroll in the program after the launch period is over, you will be taken to this page where you are asked to join the waiting list. ​The major advantage of this strategy is that there is a time limit for enrollment that instills a strong sense of urgency and pushes users to make a decision. Also, the students join your course in batches, so you can work more closely with them. The disadvantage is that the course is not always open for enrollment and prospective students will have to wait for some time before getting access. Another disadvantage is that launching a course each time can be a time-consuming process. The other approach is to make your online course evergreen. Evergreen courses can be taken anytime and the user doesn't need to wait. Melyssa Griffin's course Pinfinite Growth is always open for enrollment. She sells this course mainly through her automated webinar funnel. The key to selling an evergreen course is automating your sales funnel which means you can focus on driving traffic and testing your funnel and email sequences on a regular basis. This is what I like the most about evergreen courses. However, it's relatively difficult to incorporate a strong sense of urgency into your evergreen sales funnel because you'll need to offer a bonus or a discount which is unique for every subscriber. So, I recommend that you keep it simple in the beginning! If you're selling a premium course ($200 and above), I recommend you follow a closed cart approach. Selling a lower-priced course is relatively easy and you don't need a similar sense of urgency in order to sell it. So, I recommend that you sell a non-premium course as an evergreen course. But that is not to say that you can't sell a premium priced course as an evergreen course. There are evergreen sales funnel strategies which are as effective as any closed cart strategy but they are advanced strategies and we'll discuss them later in this chapter. Whether you're launching a new course or you're opening the doors to an existing course, you need to get your launch strategy absolutely right. So, let me briefly discuss how to launch your online course. There are two phases to your course launch: Pre-Launch and Actual Launch. In the Pre-Launch phase, the idea is to nurture your audience and prepare them for the launch. You can send blog posts, videos etc. via email that will help educate your subscribers about the problem that your course solves. As far as the number of emails is concerned, you should send at least 4 emails over a period of 7 days. In the last email that you send in the Pre-Launch phase, make an announcement that you'll be opening enrollment to your course soon. Introduce your course briefly here but don't provide specific details about what's actually in the course. Day 1 - "What is the Course Email" - Tell what's in your course. Talk about various modules and what the students can expect to get from each module. Also, mention that the course cart will open tomorrow. Day 2 - Course Opens Email (+24 hour discount) - Tell your users that the course is open for enrollment now. Include a link to the sales page and explain how they can enroll in the course. Also, mention that they get a special discount if they buy in the first 24 hours. Day 3 - Last Call for Discount Email - Say that the special discount is going to expire in the next 3 hours. Keep this email short and try to build a sense of urgency. Day 5 - FAQ Email - Answer the commonly asked questions for your course and tackle common objections in this email. You should talk about how long they will have access to the course, money back guarantee, what's included in the course, payment options etc. Day 6 - Surprise Bonus Email - Announce a surprise bonus to your audience. You can offer some other course, e-book, group coaching calls etc. as a bonus. Tell them that you want to make their decision to enroll in the course a no-brainer. Day 8 - Thank You & Social Proof Email - Tell them how much you appreciate them being part of your launch. You should include some testimonials, social media messages etc. that will help you build social proof. Day 9 - Logic + Cart Closes Email - Remind the users that the cart will be closing soon. Build a logic as to why they should buy now and make sure to mention your surprise bonus. Day 10 - Cart Close Email 1 - Send a quick reminder to the users that this is the last day to enroll in the course and briefly summarize what they will miss out if they don't enroll. This email should go out in the morning. Day 10 - Cart Close Email 2 - Send a last reminder to users that the cart will close soon and there is no way they can enroll in the course. This email should go out 2-3 hours before the cart closes. Now, your actual launch strategy can differ based on your niche, your audience, and your course pricing. This sort of an approach is ideal for launching a premium course. However, if you are launching a lower-priced course (say $99) to your audience, you can simplify this launch sequence, and sending even 4-5 emails will work. There are some strong arguments in favor of keeping your online course enrollment always open and the strongest one is that your students can enroll in your course anytime they want and they don't need to wait for your next launch. Day 1 - Introduce Your Course - Introduce your course, explain what's in the course, what they get when they buy it and what they can expect to learn from it as well. Day 2 - Overcome Objections - Tackle all the objections that your potential customers might have and help them decide whether the course is right for them or not. You should also answer questions related to your target audience, refund policy etc. Day 4 - Case Study & Social Proof Email - Include any testimonials from your past students or clients. If possible, include a case study and share how you helped your student get results in the past. Tell them they can also get similar results by enrolling in the course. Day 5 - Opportunity Cost Email - Create a sense of urgency by pointing out the opportunity cost of not enrolling in your course now. Build a case of why they should enroll now and remind them that there is a money back guarantee, so it's a no-brainer. If someone doesn't buy the course during your evergreen campaign, you should put them into your regular newsletter so that you can keep them engaged and sell again in the future. While this sort of an approach works well for selling lower-priced courses, it won't be effective for selling a premium priced course and the simple reason is that your subscribers will need a stronger push to purchase a higher priced course. In order to make a stronger push, you need to offer a special discount or a special bonus which is available only for a limited time but at the same time is unique for each subscriber. In order to achieve this, you'll need to use a tool called Deadline Funnel that lets you create evergreen deadlines which are unique to your subscribers. Deadline Funnel tracks your visitors using both IP and cookies and thus lets you create an expiring offer that is genuine and your users can't see an expired offer simply by visiting the page in a private window or a new browser. Deadline Funnel is an advanced tool and there is a steep learning curve attached to it as well. So, I don't recommend that you follow this approach if you're just getting started. This will unnecessarily overcomplicate things which isn't desired in the beginning and so, a closed cart approach would be the best option for you to sell your premium course initially. In this guide, you learned in detail how to create & sell online courses from your own website. We went through all the steps that are involved in the process right from finding an idea to creating your course and selling it. Now it's your turn to implement what you have learned in this guide and while doing that, try to keep things simple in the beginning. It's very unlikely that you're going to get everything right the first time. So, focus on getting things done rather than aiming for perfection. And you can always tweak and improve things as you move forward. Another thing you should keep in mind is that there are no shortcuts to building a sustainable online business and you'll need to put in some serious work before you'll get any significant results. But if you do things the right way, believe me, the results will be worth it. I hope you enjoyed this step-by-step guide on How to Make Money Selling an Online Course. You can download a PDF copy of this guide and take it offline. If you’re new to creating & selling online courses, it’ll be extremely helpful to go through this guide a second time, even referencing it when you go out and try putting everything into action. ​What did you think of the guide? Or maybe you have a question. Enter your email address and I'll send you a PDF copy of the guide now!